19th Sunday Yr A – feel safe in a storm? The mountain of Horeb was another term for the famous Mt Sinai where Moses met face to face with God. Unlike Moses, Elijah is being chased. He challenged the Queen for putting statues of Baal in the temple, killed 400 Baal prophets and is running frightened in the desert. He seeks God. He experiences God in the ‘tiny whispering sound’ of God’s voice in prayer. Have you had an experience of doing something for God and it meets resistance? Where do you go to seek God? What would you say you have heard recently from God? In St Paul’s letter to the Romans, chapters 9-11 reflect a great sadness that the Jewish people – Paul’s own people – have not recognised and believed in Jesus. Have you experienced sorrow and anguish for someone who has not believed in Jesus or has left their christian faith? Consider placing them before God in prayer. Paul used this anguish to become an incredible missionary and very talented in preaching in a relevant way. How could you be more missionary? After feeding the 5000 people start to suggest that Jesus is the long awaited messiah. This has dangerous consequences. Herod, who has just killed John, could be identifying Jesus as the next target and threat to his power. He ‘compels’ (in the greek) the disciples to leave. Dissolves the crowd and goes up the mountain to pray. Not only does he wish to mourn the loss of John his close friend and cousin. He is also teaching the disciples about mission (Mt 14) and seeks to be grounded in prayer with God. A boat tossed about in the sea has always been an early symbol of the Church. In the middle east the rough sea was considered a symbol of darkness and chaos. Throughout history many storms have caused the Church to cry out to Jesus for help. Walking on water is a display of Jesus’ power over all chaos and darkness along with his use of the Divine Name ‘It is I’. A simplification of the divine name given to Moses on Mt Sinai. While the english uses ‘tossed about’ the greek word is literally ‘tortured’. What forces torture you and the church today? Imaginatively enter the boat scene and hear Jesus personally say the words ‘ Take courage, do not be afraid’ to you. What would this mean for you? Peter represents church leadership but also the individual disciple. Urged to take the risk of obedience to Jesus’ word the ‘walk on the water to Jesus’ can be sunk by dwelling on the experience of strong winds and big waves. Problems. Fear. Sinking. What could you pray for God to ‘save’ the Church from today? Save you from today? Jesus is invited into the boat. 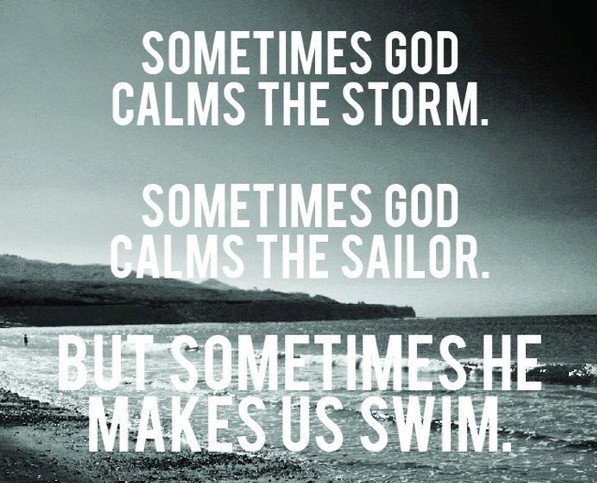 The storm calms. Their crisis and Jesus’ help leads them to bow down humbly. Have you had an experience like this?